So, Wanamaker looks particularly comfortable out there. He is not as quick or crafty as Larkin, but he sees the floor very well, and seems to be able to shoot very well, (although his Europe numbers don't really stand out in that regard). I really love Terry, warts and all, but Wanamaker, to me, seems to have made moving him the obvious move. There have been a few guys now that have gone to Europe or Australia, played OK there - nothing special, and have then reached the NBA and taken an even bigger step. I'm thinking Ingles and Ennis, but there are others I just can't think of now.. Does anyone think it possible that Wanamaker has even more "late-career" improvement left in him, or is he now what he is? Wanamaker looks like he has a chance to find a spot with this team moving forward. Assuming Rozier is gone, it will be interesting to see how Danny utilizes the upcoming draft picks. I wouldn't be surprised to see him target a rookie PG with upside. Wanamaker might be able to earn some more minutes next year unless a veteran PG signs for cheap. 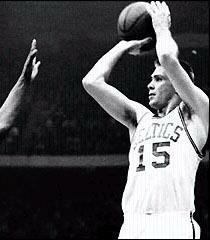 As for Terry, I don't see Ainge moving him unless he finds an absolute slam dunk trade. Terry has his inconsistencies but he also has the ability to provide a major impact with his ball pressure, athleticism, and streaky scoring. Brad can ride Terry when he's hot without relying on him to play big minutes in the playoffs. Every time Brad comes in and looks good I can’t help but think, if only we had a legit point guard on the second unit. Wanamaker was a plus 24 last night. Rozier was a plus 2. I like Wanamaker better as a backup point guard. Wanamaker's been looking better on the floor recently but he's still no Shane Larkin. Once he can get people to forget about Larkin, he can start working on getting people to forget about getting a competent vet PG for his spot on the roster. People remember Larkin foundly because he hit a few big shots last year, but he really wasn't that good at running the second unit. He wasn't better than Wanamaker. In fact, Wanamaker is more of a threat because he can finish on drives -- something Larkin struggled with greatly. Wanamaker has been more efficient and productive on the court than Larkin was last year. Even off and def ratings suggest the second unit is better with him. Added to this, Larkin had several seasons to get used to NBA life, schedule, and athleticism before he played for the Cs. This is Wanamaker's first year. He has gotten better and better as he's played more. BW looks like a better fit with the 2 unit. I don't really understand the hype that Larkin gets from some people. He made a difference in a few games for us, but overall he gave us very mediocre, replaceable minutes. He was a third-string guard who played like a third-string guard. Part of the game that stat oriented analysis might overlook is the entertainment value a player provides. Larkin often provided a level of hustle that was a step above other players. He was fun to watch. Yes, it was frustrating seeing him get burned on defense and missing drives to the hoop. However, his heart couldn't be measured by any stat. Thus, while Wannamaker may be a better overall contributor, many of us still appreciated the inspiration and entertainment value Larkin provided. MIL kept forcing that Middleton vs. Larkin matchup. Maybe Wana would hold his own against mismatches better in a potential MIL series. I like Wannamaker's size and he seems comfortable on an NBA floor. If Danny gets a strong Rozier offer before the deadline, I'm not going to stress about the backup PG position. As Wanamaker plays like a third string PG. The thing about moving Rozier to give Wanamaker his position as 2nd string PG is that sometimes he needs to be the starting PG because Irving tends to miss games every year. There is no way Wanamaker can replace Kyrie as a starter the way Rozier can. None. You can let marcus play PG, and Brown SG. Yes, he can. Wanamaker shoots much better than Rozier and is a better point guard. Rozier rebounds better. Trade Rozier to open up more minutes and shots for Gordon Hayward. Celts will be fine with Wanamaker as backup PG.